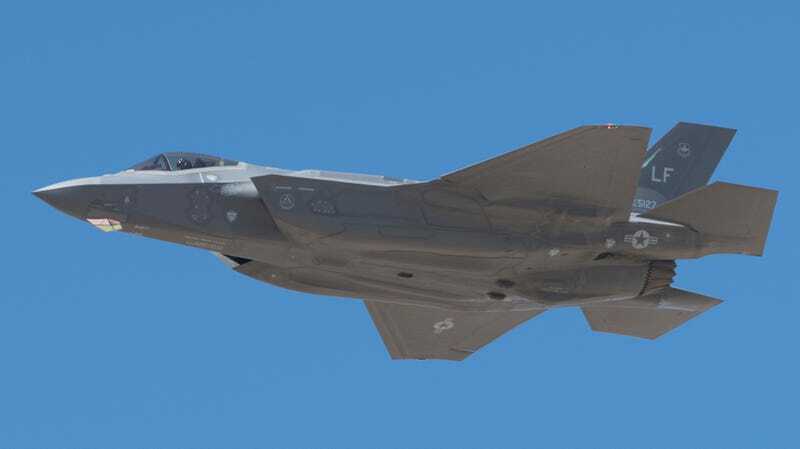 The F-35 Lightning II, a jet capable of doing all the things fighter jets normally do, may take on the new mission of swatting down ballistic missiles threatening the United States and its allies abroad. A new Pentagon review of U.S. missile defense policy advocates developing a new interceptor missile for the F-35, but is it even possible? Ballistic missiles work by rocketing into space and then releasing their warheads—including nuclear warheads—on ballistic (naturally) trajectories to hit targets hundreds or thousands of miles away. Ballistic missiles are fast— moving many thousands of miles per hour, striking targets across entire oceans in a matter of minutes—and have proven nearly impossible to shoot down. The three phases of missile defense. Right now, the “best” way to shoot down a ballistic missile is with another missile (best being relative, of course, considering it doesn’t really... work). There are three main stages to achieve an intercept: in the boost phase, while the missile is taking off from the ground, in the midcourse phase as the warheads are zipping through space, and the terminal phase, as the warheads are streaking through the atmosphere toward their targets. The best defense against ballistic missiles is a layered defense that engages the threat at all three stages: boost phase (when it’s just taken off), midcourse (as it’s shooting through the upper layers of the atmosphere), and terminal (when it’s headed down at hypersonic speeds towards its victim). The U.S. Ground Based Midcourse Defense (GBD) interceptor, sitting in silos in Alaska and California, is supposed to target warheads in the midcourse phase, while the Patriot PAC-3 missile aims to shoot warheads down in the terminal phase. Right now, the Pentagon doesn’t have the capability to engage missiles in the boost phase. (An attempt in the 2000s to develop a Boeing 747 with a giant laser sticking out the nose, seriously, for boost phase was fraught with problems and cancelled.) Boost phase engagement is an attractive one, because the missile is initially moving slowly. It is also attractive for engaging missiles carrying multiple warheads—one interceptor could shoot down a missile carrying up to a dozen incoming warheads, negating the need to track and destroy those warheads separately. A YAL-1 prototype, which was supposed to shoot missiles out of the sky with its giant laser. In theory, it all sounds very neat. An existing combat aircraft, often criticized for its high cost, could take on a new mission making it more cost effective. The F-35’s Distributed Aperture System sensor suite could detect the massive heat plumes of a ground-based ballistic missile launch and pass the data to missile defense forces. Down the road, the aircraft itself could become the launch platform for an interceptor, theoretically, if the U.S. could get one to work. The aircraft will likely be in the combat theater anyway, based on an aircraft carrier or at a regional air base. Just tack a new missile on the F-35 and voila, the Pentagon has a new way to shoot down ICBMs. A March 5, 2017 launch of four North Korean Scud-ER missiles. The warheads later fell into the Sea of Japan. Mobile launchers like these exponentially increase the area needed to search for them. A critical look at this proposal however reveals a whole suite of potential problems. For one, most modern ballistic missiles, especially North Korean ones, are mobile, meaning they can travel on existing road networks and practically pull over and launch from the side of the road. This greatly increases the area in which they can operate and that U.S. forces would need to search and locate them. Even tiny North Korea, with just 500 miles of paved roads, would have thousands of square miles to hide mobile missiles. Blanketing such a wide area with missile hunters would require a lot of aircraft in the air at once. Aircraft would have to fly in shifts, necessitating one or more additional aircraft standing by for every aircraft in the air. Even more aircraft are needed if you factor in the F-35’s current readiness rate, which predicts that for every ten fighters, only seven will be ready at any one time for combat. And that demanding mission schedule could go on for weeks as a missile crisis dragged on. F-35 launching an AMRAAM air-to-air missile. The actual intercept is another massive problem. The F-35 has to catch the ascending ballistic missile literally within seconds of launch in order to make a successful intercept. Anyone who has watched a SpaceX launch on YouTube and observed a Falcon 9’s velocity rapidly tick upward knows that missiles start slow but accelerate very rapidly. Air to air missiles, on the other hand, accelerate rapidly but at a certain point their rocket motors burn out and the missile is cruising toward its target, quickly losing speed. While this might not matter much if the F-35 is very close and the system works perfectly, at longer ranges the F-35’s missile could be forced into the dreaded “tail chase” scenario in which the interceptor slows down just as the ballistic missile is speeds up. The Pentagon has admitted current missiles, including the AIM-120 AMRAAM air-to-air missile, would probably not be up to the job, according to Defense News. The military would need to develop a new missile, ideally with a very large rocket motor. And if the missile is too big it won’t fit in the F-35’s two weapons bays and will have to be carried externally, making the stealthy aircraft easier to detect by enemy radar. North Korean Pukguksong-2 medium range ballistic missile, launched from a tracked vehicle. Could the F-35 ICBM as ICBM killer work? If the boost phase mission is that important, it’s probably worthwhile to develop a new aircraft, ideally an unmanned one with a large payload bay that can fly for days at a time, to loiter over potential launch zones. The Missile Defense Review specifically mentions developing such an unmanned aircraft to carry a missile-zapping laser, but such an aircraft could probably get into service sooner if it carried missiles instead. And that’s assuming they could get the whole system, missiles and all, to work. Which they can’t really so far. Only sometimes. In specific conditions. Missile defense is a complex, high stakes game with no tolerance for failure. A 99 percent success rate still lets one nuclear warhead out of one hundred through, potentially killing and injuring millions. The F-35 as a missile killer feels like the wrong tool for the wrong job, the Pentagon shoehorning a new capability into an existing platform for no other reason that it can.